Summer is upon us and we’re ready to hit the beach! If you haven’t settled on where to go for your summer vacation yet, consider taking a trip to Japan’s subtropical paradise: Okinawa. Okinawa is Japan’s southernmost prefecture that consists of 160 large and small islands including 49 inhabited islands over a vast ocean area. It is located along the similar latitude as Hawaii, Miami, Cancun, and other popular resort areas, and it is warm even in winter due to the subtropical oceanic climate. Long a popular destination for Japanese travelers looking for a relaxing vacation by the sea, Okinawa is also starting to gain international popularity because of its rich coral reefs, crystal-clear blue seas, white sand beaches, and beautiful natural scenery. One of the caves at Okinawa World. Okinawa World is a theme park that will introduce you the best of Okinawan culture and rich natural reserves. The park’s main attractions are a massive natural cave, a craft village and a snake museum. At the theme park, tourists can try wearing the Okinawan traditional and watch a live Eisaa performance. Eisaa is the prefecture’s traditional dance that involves 20-30 men and women singing and dancing together while playing the taiko (Japanese drums). The Shuri Castle is a Ryukyuan gusuku (castle) in Shuri, Okinawa. Between 1429 and 1879, it was the palace of the Ryukyu Kingdom. The castle was almost completely destroyed during the Battle of Okinawa in 1945. Today, Shuri Castle is one of the most popular attractions in the prefecture and is one of the UNESCO World Heritage designated Castles of the Ryukyu Kingdom sites. Inside the castle are exhibits that outline the rich history of the Ryukyu Kingdom, as well some historical artifacts that were either made on the island or received during foreign trade. The main hall, or Seiden, has been rebuilt in its original style so visitors can get a feel of the splendor of the kingdom during its prime. A replica of the king’s throne and crown are among the exhibits. Okashi Goten is a souvenir and sweets store made popular by their Beni-imo delicacies. Beni-imo is a purple-colored sweet potato that is very popular in Okinawa. At Okashi Goten, you can stock up on as many beni-imo sweets that you want as well as other Japanese snacks like mochi. And because the factory is located beside the shop, tourists can also observe how the tarts are made and even experience making the sweets on their own. If you’re more into adrenaline-pumping activities rather than sightseeing, make sure you give the buggy ride tour in Okinawa a shot. You can take a tour of the forest with your friends or family, because the experience is definitely better if you come in a group! Looking for the best place for your shopping spree? 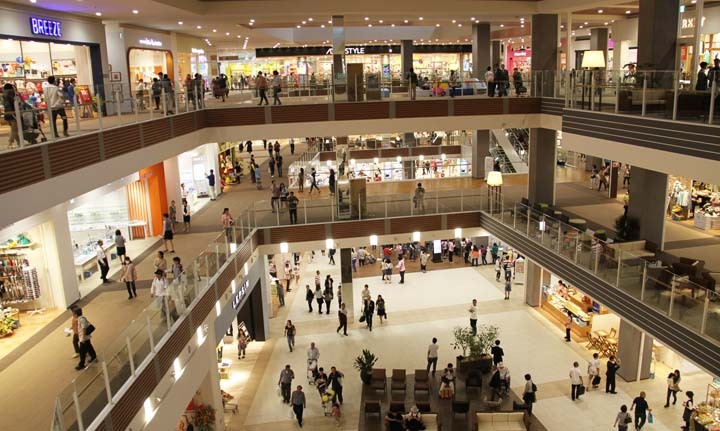 That’s probably the AEON Mall Okinawa Rycom—the largest shopping center in the prefecture. The mall has over 200 stores, 60 restaurants, a multi-plex theater, and a wide parking space so you wouldn’t have difficulty finding a spot. Another option is the Okinawa Outlet Mall Ashibinaa, which is very convenient if you’re flying in because it is approximately only 15 minutes by car from the Naha Airport. There are more than a hundred well-known brand stores offering outlet prices in this mall, so you can buy pasalubong with lower prices. Naha’s Kokusaidori Street (or “International Road”) is the main street of Okinawa’s capital. It is lined by restaurants, cafes, bars, hotels, souvenir shops, boutiques and department stores. Many shops remain open until 11pm, and live Okinawan music is played at several restaurants. It’s the perfect area for a nighttime stroll, or if you just want to get a taste of the everyday life of the locals there. You can also check out the colorful Heiwadori, Mutsumidori and Ichiba Hondori arcades, which branch off Kokusaidori around the intersection with Okieidori, halfway along the street. The arcades are made up of small booths ad single shop owners, so you might find cheaper items there. Aside from the Eisaa performances we told you about, you can also catch live performances of Shima Uta in the prefecture. Shima Uta is Okinawa’s folk songs tradition that originated from the Amami Islands, Kagoshima Prefecture of southwestern Japan. In Okinawa, there are several restaurants where you can enjoy a live Shima Uta performance while you are dining. Inside the Super Star Virgo Cruise Ship. How to get to Okinawa? Philippine Airlines offers direct flights from Manila to Fukuoka, Japan. Local airlines can take you to Naha from there. But If you’re looking for something more comfortable and luxurious, try taking the Super Star Virgo Cruise Ship to Naha instead. Learn more about the cruise here. *JNTO would like to express their thanks to Philippine Airlines and Super Star Virgo Cruise Ship for their assistance for this trip.